0 Comments Published by KL Ocs Kid on Monday, July 2, 2007 at 6:13 PM. 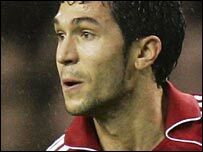 Liverpool midfielder Luis Garcia is on the verge of re-signing for Atletico Madrid, according to his agent. "We are working on Luis Garcia's permanent transfer to Atletico de Madrid," the 29-year-old's agent Manuel Garcia Quillon told PA Sport. "If all goes well, the deal should be completed either today or tomorrow." Atletico are also negotiating with Liverpool over the sale of forward Fernando Torres, who could be making a switch to the Anfield club for £26.5m. The Spain international has played 121 games for Liverpool, scoring 30 goals.